I'm trying to add Lorelei to the Ice Path. It's simple enough to add a new person_event with a Lass sprite. But when I change it to use SPRITE_LORELEI, the other sprites glitch: the nearby smashable rock turns into the player sprite, and the player turns into a smashable rock depending on how you face+walk. I've been having similar issues with outdoor maps that depend on their group's sprites being declared in engine/overworld.asm, but didn't expect any problems with an indoor map. Here's everything I did to add a Lorelei sprite to the game. Is there something I missed? • constants/sprite_constants.asm: Add "const SPRITE_LORELEI" after "const SPRITE_STANDING_YOUNGSTER". • gfx/overworld/sprite_headers.asm: Add "LoreleiSprite: sprite_header LoreleiSpriteGFX, 3, WALKING_SPRITE, PAL_OW_RED" after "StandingYoungsterSprite". • gfx/overworld/sprites_3.asm: Add "LoreleiSpriteGFX: INCBIN "gfx/overworld/102.2bpp"" after "StandingYoungsterSpriteGFX". • gfx/overworld/102.2bpp: This image, the same size as other walking sprites, converted to 2bpp with gfx.py. I tried adding SPRITE_LORELEI as one of the Group3Sprites in engine/overworld.asm just in case, but of course that didn't fix it. Here's BGB's view of the VRAM in both cases. I don't understand why changing LASS to LORELEI makes the rock and Poké Ball load in different locations. Edit: I rearranged the three person_events so Lorelei is the last one—now it's SPRITE_POKE_BALL, SPRITE_ROCK, SPRITE_LORELEI instead of SPRITE_LORELEI, SPRITE_POKE_BALL, SPRITE_ROCK. And the problem has disappeared. All three sprites, plus the player, look correct, even after I open and close menus. 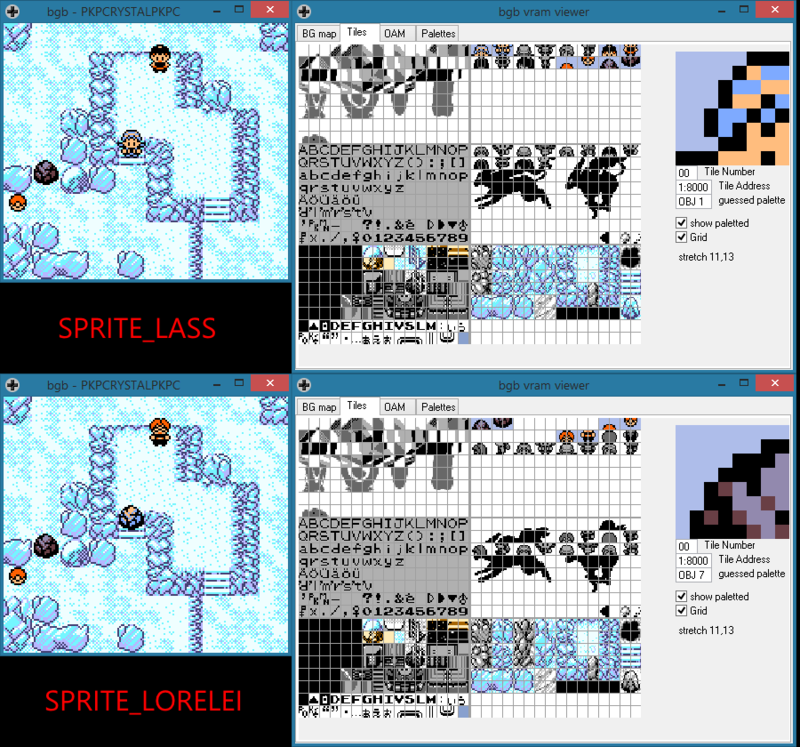 Interestingly, SPRITE_POKE_BALL is 083.2bpp, SPRITE_ROCK is 088, and SPRITE_LORELEI is 102. Is this an unmentioned requirement of the person_events, that they have to be ordered by sprite ID? Or is the reordering just coincidentally hiding some deeper bug with my code? Has this issue ever been fully figured out? I'm in a very similar situation. I have a the same setup with a 3rd section containing two additional walking sprites that I'm trying to use inside a cave. If I only call one of them, as long as I call it last, I'm good to go. But if I try to call both, whichever one is last replaces the player sprite, and on opening text or a menu, the NPC and player both turn into player sprites. I'm confused because it doesn't seem to matter what I call last; if I create an NPC with SPRITE_OAK, then Oak will also replace the player in the same fashion. And I can use any combination of walking sprites in any order from the first two banks with no problem?